I am not a hunter, in the literal sense; more of an alley walker, stalking dumpsters and backyard scrap heaps for promising prey, old wood, discarded appliances, mint-condition cardboard. My trophies are oft-unappreciated, fading into the background of my apartment. No longer. Here is a way for us rifle-less sportsmen to decorate our bars, dens, and studies. With some weathered, old-growth wood, a bandsaw, and a free afternoon, I made my own deer mount with angular antlers and a smooth, modern appeal. Without fur, it won't hold smells and moths; without eyes, it won't creep out little children; and without killing anything, it will appease the militant vegan faction. So, grab some tools and go deer yourself. I designed this deer head for a class I teach at the ReBuilding Exchange. The relatively simple form and limited set of skills is perfect for a short class, as it teaches a straightforward, measurable objective in a reasonable amount of time. In addition to the class, we may be making multiples of these for sale. 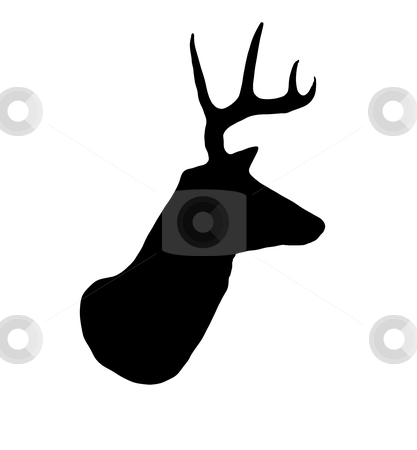 So, for smooth and efficient reproduction, I made templates for the head and antlers. Templates and jigs in the woodshop are an art unto themselves; for this little project, I used masonite to make the stencils, as the edges will hold up through thousands of tracings. Start with a stock image of a deer head. Lacking a printer, I just sketched it onto the masonite. If you have a printer, scale it to the size of a standard letter-size sheet of paper, or 11" x 17". Glue it to the masonite and cut it out on the bandsaw, sans antlers. Alternately, if you're not making multiple heads, just trace it onto cardboard and cut out with scissors or a boxcutter. Some of my co-workers suggested the ear on the head makes it look kind of like a German Shepard. Point taken; eliminate the ear if you like and round off the top of the skull so it doesn't look like a bare flat spot. The antlers are free-form, about a foot long each, some angular, some curved. Alternately, random shop cut-offs, pieces of broom stick, pieces of metal scrap -- the possibilites are endless. Just pick something with a sculptural presence, tack it on, and see how it looks. Once traced onto your blanks, use a bandsaw to cut out the head, antlers, and plaque. For woodworking beginners, a bandsaw is a large, stationary saw that has a blade shaped like a loop. It runs over two wheels, spinning continuously. The thinness and flexibility of the blade allow you to make curved cuts that would be impossible on a machine that uses a circular blade. However, the blades can snap if you put too much pressure on them. In tight spots, like the crooks of the antlers or where the ear meets the top of the head, make a series of relief cuts to keep the blade from getting trapped. A relief cut is an incision that makes a wedge of negative space, allowing you to rotate the piece of wood without bending the blade. The rest of the bandsaw is easy -- just like kindergarten! When you used to cut shapes out of construction paper, the teacher would tell you to move the paper, not the scissors. The bandsaw is a similar situation, as the blade is fixed and you must rotate your workpiece to make the necessary cuts. When done, sand all the edges and surfaces with some hand sandpaper or a random-orbital sander. Strike a centerline on the back of the plaque and pre-drill two holes, counter-sinking so the screws will drive flush. Drive the screws so they just poke through the front of the plaque; use the screw tips to locate your deer head and center it. Pre-drill into the deer head. Coat mating surfaces in glue, then drive the screws home. Mount the antlers with a spot of glue and a screw. If you want to hide the screws, plug the holes with a scrap of dowel. Drill two holes in the plaque so you can mount it to the wall. Use some heavy-duty drywall anchors so you can hang stuff on the antlers. about bagging "the big one". That's awesome. The mounted heads look great, and I bet your pupils learned a ton. The bandsaw wood-paper-kindergarten analogy was particularly good. How cute it is! Congrats.